The Great Buddha at Nofukuji Temple in Hyogo (currently Hyogo-ku), Hyogo Prefecture. 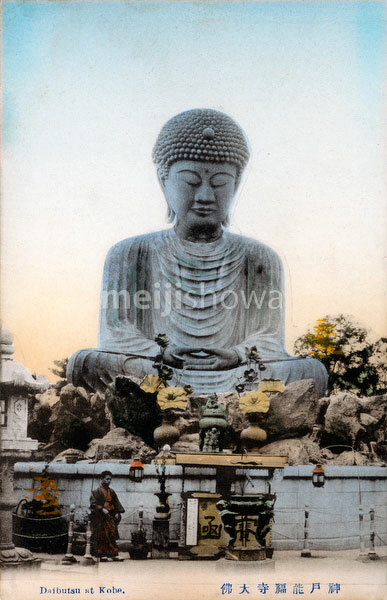 The statue was built in 1889 (Meiji 22) by wealthy merchant Nanjo Sobei when efforts were made to revive Buddhism under the onslaught of Christianity and State Shinto. The statue was consecrated on March 15, 1891 (Meiji 24), and soon became a very popular tourist attraction. The statue was melted down for the war effort in May, 1945 (Showa 20), but the pedestal remained. It was finally used again for a new Buddha statue, larger than the original, in 1991 (Heisei 3).